India-Bangladesh relations for last one decade have been transformational for the North-east region in many ways. The Awami League Party (ALP) came to power in Bangladesh in 2008 with a mandate of ‘Din Bodol’ to restore peace, harmony, progress and cooperation with other countries and promising reestablishing political democracy and liberalism replacing the earlier theocratic and militarized regime. Sheikh Hasina ’s special emphasis on bilateral relation with India has been a deep gesture of gratitude to India. This helped India to reconfigure its own policy towards Bangladesh having its North-east as a central space. The decades old cross-border hostility which had affected the North-east region the most began to change towards positive engagements. Bilateral ties started to harp on deep roots of history, geography and culture, while economic and commercial bilateralism harped on inter-linkage and interdependence. The two neighbours lived in an uneasy relationship after 1947, with closure of land routes and creation of enclaves within an unsettled political boundary. Though in 1972, the India Bangladesh Treaty of Friendship, Cooperation and Peace forged closer bilateral relations, it never resolved cross-border disputes. Due to the pressing political, economic and social turbulence in Bangladesh, illegal immigration, amongst all, became an everyday reality in India’s North-east. This long, open, fluid and disputed, but defined boundary also became the subject of various trans-border illegal activities and illegal movements of people and goods, informal cross-border economic activities, leading to conflicts and eventual militarization of borders. With illegal immigration being one of the major causes of conflict, the North-east turned into a battlefield by the 1980s with rise of underground militancy, while the previous political regime in Bangladesh extended safe havens to various such outfits for a long period of time. The turning point arrived in 2008. 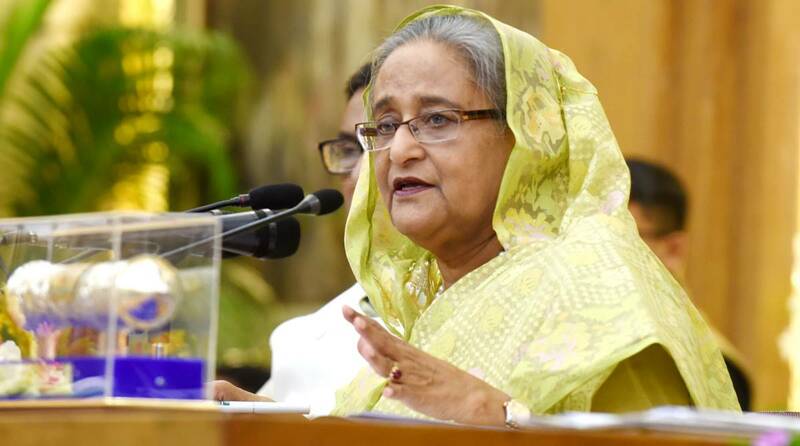 Sheikh Hasina took a clear categorical position not to allow any kind of underground militancy from her soil to destabilise India’s North-east. Subsequently, an agreeable bilateral relation also allowed India to create International Barbed Wire Border Fencing (IBWBF) on the zero line across this long open international border between India and Bangladesh. The reports show that in the last one decade, various illegal cross-border activities could be restrained largely due to such IBWBF. Sheikh Hasina’s visit to Tripura in 2012 was historic in reconfiguring the changing role of Bangladesh in India’s North-east. She signed a Peace Treaty for Chittagong Hill Tracts to end two decades long conflict and took back 62,000 refugees from Indian soil. Such proactive measures made a qualitative shift in the existing cross-border security issues, and both the nations started to move beyond. Economic cooperation became a reality having trade and investment as the pivots. Bangladesh has achieved a lot on socio-economic fronts and is no longer seen as a ‘basket case’. It has addressed the issue of poverty at policy level through 10 years’ poverty reduction strategy, which has declined to 22 per cent in Bangladesh, much lower than many states of India’s North-east. With its expected economic growth of about 7 per cent, it has done extremely well in respect of social indicators. Creating various opportunities and livelihood for its vast labour force, Bangladesh aims to be a middle income country by 2021. The country with its strategic location, started to restore various cross-border routes for official economic engagements, where India’s North-east was once again positioned as an important space. Before 1971, when Bangladesh was born, many routes and transits were sealed making India’s North-east a ‘landlocked’ space, affecting the ageold cross-border trades and local economies in the region immensely. The states of North-east also faced the problem of accessibility to the mainland India, without transit through Bangladesh. In 2015, Bangladesh gave transit rights to India when the Land Boundary Agreement Bill (LBAB) was passed in the Indian parliament. This was seen as the most commendable achievement in India-Bangladesh bilateral relations post 2008. The earlier political regime in Bangladesh had strong reservations against giving such rights to India on the pretext that it would infringe on the sovereignty of Bangladesh. This had delayed access to the landlocked North-east and halted several development projects of the region including connectivity projects. Transit rights therefore are historic in contemporary bilateral relation to reconnect the lost routes, create new routes and make the space vibrant for legal movement of people and product, and finally improving the local, regional and national economies. This transit right is for road, river, sea, railways, and also for carrying out big commercial projects like petroleum pipeline, foodgrains and digital-links; and was seen as ‘the catalyst for deeper engagement’ between the two nations. Bus routes, rail links, bridges, and ports to facilitate trade and improve communication are now operating between the two neighbours. Today Kolkata-Dhaka-Agartala and Dhaka-Shillong-Guwahati bus services are fully functional. India and Bangladesh have decided to construct a bridge over Mizoram’s Khawthlangtuipui river to facilitate trade and improve communication, just like the Chittagong and Mongla Ports and East-West Line railway links. A supportive, stable and secured Bangladesh is essential to transform India’s Northeast. Though this new journey benefited the North-east, the logic of economy does not necessarily take away the geographical imperative, where proximity and commonness can generate both intimacy and hostility at any time. So, any political change in Bangladesh can make the North-east vulnerable once again. Last decade however has been extremely crucial to rebuild trust and goodwill with a changing Bangladesh, but the challenge is to sustain it through deeper engagement and trust and to build upon this trust. The efforts of Bangladesh to be seen as a trustworthy, peaceful, cooperating and thriving neighbour have benefited India in general and Northeast in particular. If the Awami League can contain its internal upheavals at this hour and win election for the third term, it is certainly going to be another dependable neighbour of India’s North-east after Bhutan.